Tanusree Shankar is the choreographer and the chief inspiration of the academy and troupe bearing her name. Tanusree, who trained for seven years under Amala Shankar, has developed a kind of choreography, which reaches out to audiences worldwide. Her choreography is not a combination of classical dances, but is original, giving concrete shape to the music that inspires it and is based on the Uday Shankar technique of “New Dance”. She choreographed several events, including the Asian Games, the Festival of India in the USSR and the Wills World Cup Cricket Championships. In 2007, she was chosen to be the chief choreographer for the National Folk Dance Festival, assigned by the Indian department of culture. Tanusree choreographed an Indo-French Ballet called Padmavati directed by Indian film maker, Sanjay Leela Bhansali, in Paris in 2008. 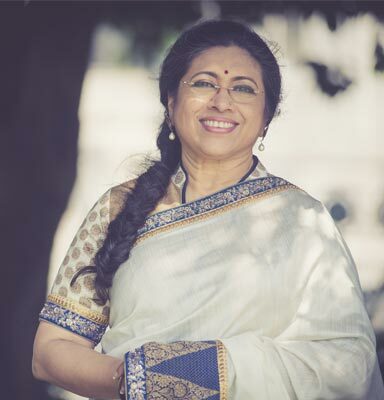 A Sangeet Natak Akademi winner, Tanusree instructs master classes at Martha Graham School of Contemporary Dance and the Alvin Ailey American Dance Center. She has also conducted various workshops in Reading for the WOMAD Festival, Birmingham and Leeds in UK. Her troupe members have participated in the prestigious Edinburgh International Fringe Festival in 2001.